April 2016 : During the last winter many WEB tools have been improved, especially EOP analysis. Mean pole displacement obtained by Gaussian filter of IERS C01 combined pole coordinates series will be regularly updated: tabulated values x ("), y(") at 0.05 year interval since 1900 and plot. September 2015 : Christian Bizouard replaces Daniel Gambis at the head of the EOP-PC service. Retired from September 1 2015, Daniel Gambis remains active as scientific adviser. March 11, 2011 (updated on March 16): Our first estimates of the megaquake of Honshu, Nothern Japan Coast , at 5:46 UT on polar motion. According to the preliminary US Geological Survey and Harvard University seismic parameters used with Dahlen's dislocation model (1973), the principal axis of inertia with highest moment of inertia (also called figure axis, closed to symetry axis) was displaced by about 15 cm at the earth surface in the direction 135° East (value confirmed by R. Gross, JPL, with another model). 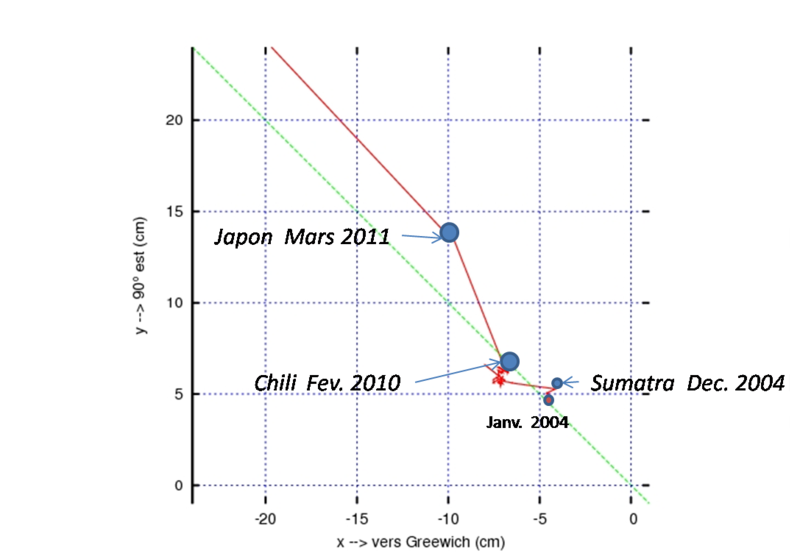 The effect is larger than for Chili (February 2010) and Sumatra (Dec. 2004) earthquakes (see below corresponding news). This could be observed as a step in the so-called excitation function, deduced from the determination of pole coordinates by space geodesy. But such a step could be hardly discernible from common hydro-meteorological processes. The oceanic angular momentum still lacking, only next months will tell us wether something is detectable. 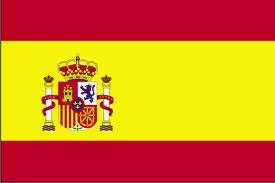 The IERS has implemented the ITRF 2008 and made it available in its EOP products on 1 February 2011. The official IERS 08 C04 solution is available at ftp://hpiers.obspm.fr/iers/eop/eopc04 and the Rapid Service/Prediction Center solution is available at ftp://maia.usno.navy.mil/ser7/. Users are advised to update their data from these sites on 1 February to ensure that they are fully consistent with the new 08 C04 system. The former 05 C04 solution will be stopped on June 2011. 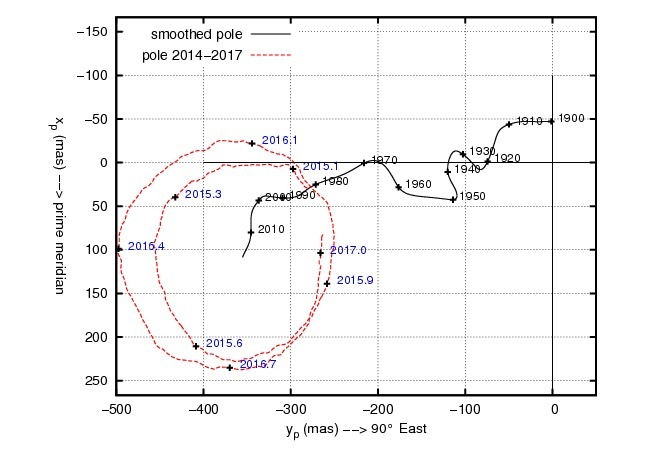 March 2010 : The Chile Earthquake of February 27th, 2010 of magnitude 8.8 has caused no DETECTABLE effect on the rotation pole and rotation rate. Independently of Earthquake, rotation pole moves of some mm up to several cm per day because of continuous atmospheric, oceanic and hydrologic mass transport. Till now the effect of Earthquake remains a theoretical matter. 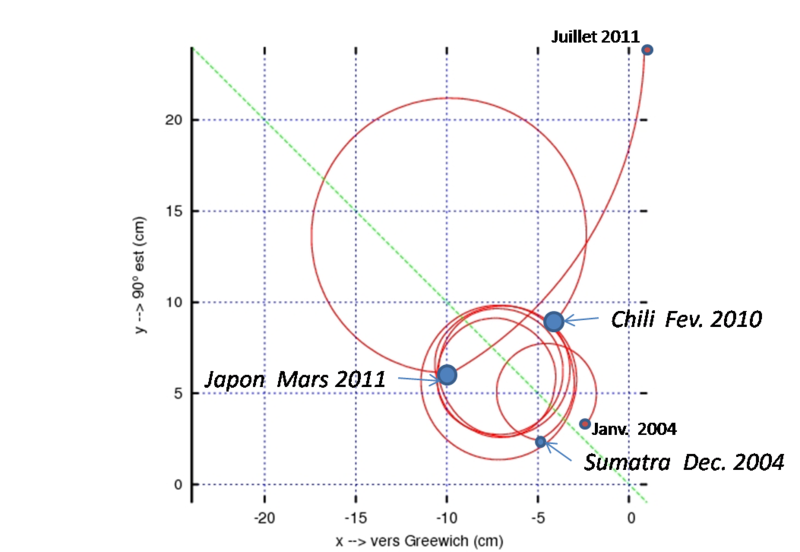 According to the seismic models, the recent Chile event will have the effect of disturbing the rotation pole by 8 cm in some months, small amount in comparison with the path a few meters it will achieve during this period. By handling atmospheric, oceanic and hydrologic data, this path will be modelled with a mean error of 50 cm, so that the tiny seismic effect will probably remain undiscernible. The Chile earthquake, would also have decrease the length of day, as high as 2 microseconds, that is to say below the current error on this quantity (10 microseconds), and much lower than the daily variation sometimes coming to 50 microseconds, and mainly caused by winds. Alone a mega-seism, such that of Chile in 1960, could cause a visible effect with the modern geodetic techniques. March 2009 : WEB tool generating tidal variations in LOD, UT1 and Earth angular velocity. February 2009 : Many improvements have been brought on the site. See in particular the comparison C04 - individual EOP. We propose a new version of Bulletin B, available on ftp://hpiers.obspm.fr/iers/bul/bulb_new/. November 2007 : WEB Service has been opened. We provide two executables (Linux/DOS) to be called in any procedure (Fortran/C/php/Perl) : i) download of EOP C04 parameter at a given date ; ii) the computation of the Earth Orientation matrix (between ITRF and ICRF) at any instant. Summer 2007 : the WEB site has been updated : analysis / comparison of EOP series (all VLBI series are given with the celestial pole offsets dX, dY referred to IAU 2000 model) ; interactive analysis of the excitation takes now into account the oceanic forcing (ECCO model). October 2005 : The atmospheric excitation of the Polar motion and lenght-of-day is available up to the last week. July 2005 : The Earth orientation Center at the Paris Observatory has decided to introduce a leap second on 31 december 2005, 23h59min59s UTC. No leap second was added during the last 6 years, since 31 december 1998, because of strong decadal acceleration of the Earth rotation (which seems presently to be over). The official ILRS combined EOP solution (avaible on our WEB/FTP site) derived by ASI from 5 individual solutions (ASI, DGFI, GFZ, JCET and NSGF) is replacing the individual SLR solutions in the EOP-PC analyses. According to this series, there is a noticable jump in y-component of the polar motion for the day of the Sumatra Earthquake. December 2004 : According to theoretical modeling of Dahlen (1973) and Harvard seismic moment tensor solution, the rotation axis would have undergo 0.5-1 milliarcsecond shift towards Pacific in a few minutes because of the Sumatra Earthquake (computation done by Ch. Bizouard). Because of the weak time resolution of Earth orientation parameters, it cannot be distinguished easily from other geophysical influence, which cause pole motion with the rate 1-3 mas/day. At the date of 1/1/2005 GPS determination of the polar motion did not allow us to prove any Earthquake effect. Wait and see. June 2004 : After a severe breakdown, the system has been updated. April 2003 : Interactive tool for the selection of EOP parameters and their plots (series C04 and C01). September 2002 :UTC Questionnaire results are available. May 2002 :EOP series from DORIS technique are available there. November 2001 : Introduction of useful constants table. October 2001 : Introduction of plots: individuals SLR series compared to C04 for X-pole and Y-pole. June 2001 : A new section proposes the individual EOP series. These are the series for the Annual Report 2001. April 2001 :New graphics are available on the site. They show comparaisons between C04 series and those of 4 VLBI analysis centers (BKG, GSFC, IAA and SPBU) on X-pole, Y-pole, UT1, UT1 intensives, dPsi, dEps. April 2001 : The C04 is available in 1 file since 1962 until now. April 2001 : The IERS web site is available in french. March 2001 : The polar motion graphic with 100 days prediction, up-dated twice a week, is now available. February 2001 : A new section is now available and proposes all the operationals series that the IERS EOP-PC receives. These series are updated twice a week. February 2001 : A new IERS format was proposed to standardize the format of differents techniques (GPS, VLBI, LLR, SLR,DORIS). 1 February 2001 : The IERS EOP-PC (EOP-PC), located at the Paris Observatory, has opened a web page.